Baby boomer women are interested in managing their health. The generation of women born between 1946 and 1964 are healthier and better educated than prior generations of women. They want to be involved with their health care management. This guide allows them to speak intelligently about their health concerns. 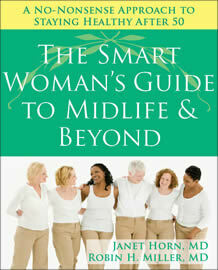 Written in an up front, concise manner, for the everyday women to understand, The Smart Woman’s Midlife Guide offers women an in depth encyclopedia about what happens with their body parts as they mature, and how to care for them. The authors share patient and personal stories that every woman can relate to. Their writing style and doctor chats at the end of every chapter make you feel as though they’re sitting with you at your Girl’s Night Out group as they discuss personal health topics near and dear to your hearts (ones you’ve discussed with your sisters and friends). You’re gonna love these two women doctors who speak your language, are very down to earth, and offer fantastic advice for women in their middle years. If you’re attempting your best midlife, I highly recommend this book to either read from cover to cover, or to rest on your bookshelf so you can reference whenever you’re interested in learning more about your maturing body. Please note: This review will be featured in Boomer: For Central Iowa's Active Adults.